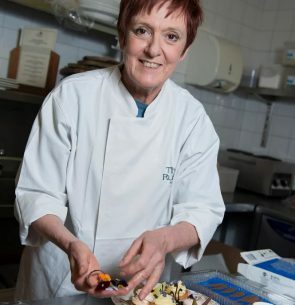 My name is Daniele Maupertuis, I am a Belgian Pastry Chef (I was baptised in chocolate!) and I have won several gold and silver medals in Culinary competitions. I have worked for 5* hotels abroad and in the UK, 6 years in Greece as Pastry Chef for a chain of Belgian Pastry shops, 6 years in Lebanon as the Executive Pastry Chef for the 5* Beirut Marriott hotel, (with daily electricity cuts, we prepared our 1st wedding banqueting by candlelight!) 5 years in the 5*Marriott Hanbury Manor (Herts) and until now for the luxury Red Carnation hotels. More and more people suffer from food allergies, or follow an ethical philosophy, or are just concerned by healthy food options, and the food industry proposes a very poor and disappointing alternative. As a Pastry Chef, I decided to create my own range of “free from” desserts focusing on taste and presentation. Challenge: They should look amazing and taste fantastic!